I’ve long loved cobalt blue for its virtually universally flattering properties, and the fact that it’s eye-catching without being completely ‘out-there’. Luckily, since the vivid shade is one of fall’s biggest hues, many options in the colour will soon be (and already are) available for our choosing! For those of us who can’t quite wait until full-blown sweater weather to hop on the bright blue bandwagon, this cobalt aztec maxi dress fits the bill perfectly: it’s the ideal breezy piece to wear in the lingering warmth now, and will be equally fun to transition into fall with a cropped denim jacket. I LOVE THIS DRESS A LOT! IT HAS THE PERFECT DETAILS TO MAKE IT INTERESTING! What a beautiful dress, and beautiful pictures. You look amazing. That’s a great dress, and I love the stark white backdrop with the graffiti. You look lovely in cobalt. what an amazing dress – i’ve always wanted a maxi but had problems with the length. will definitely check this site out. did you have to hem the dress any? Gorgeous dress ,that color looks amazing on you,you look lovely and love the background.
. show como sempre! amei! bj. fique com DEUS. by Brazil. That dress is so so gorgeous, loveee the bright blue- great colour on you! what a super cute dress!!! I love the pleats and ribbon! Amazing, Jen. LOVE the dress and the bright red lips… and where is that wall??? I totally agree on cobalt! It is bold but not overwhelming. Plus it looks great in shirts, pants, blouses, dresses, everything really! I love how it looks with the cream and black in this dress. And love the spot you took these photos, so cute! Oh my goodness, I am LOVING that dress. The pleats look extra gorgeous and the colorblocking is beautiful! That dress is stunning on you! I love the classic colors. Is that a Banksy on that wall? Love the black details of this maxi, beautiful! I cannot get over how beautiful this dress is. The cobalt blue is so vibrant and such a great colour on you. The wall art you found is adorable too, I haven’t stumbled upon that in Vancouver before! I love this dress. It suits you beautifully, Jen! great maxi, love the ribbon around the waist! Great dress and the colour is fab too! The dress is beautiful on you Jen! 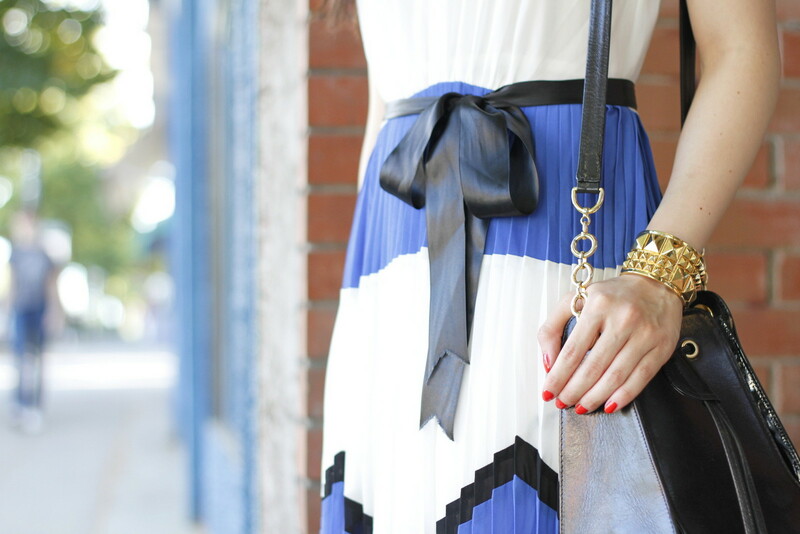 That is the cutest maxi dress! I love cobalt on you. 🙂 It’s such a stunning colour that lets the wearer’s skin glow!! Such a lovely dress – it looks beautiful on you! I would totally steal that dress off your body! I LOVE IT. And you look amazing in it, Jen!